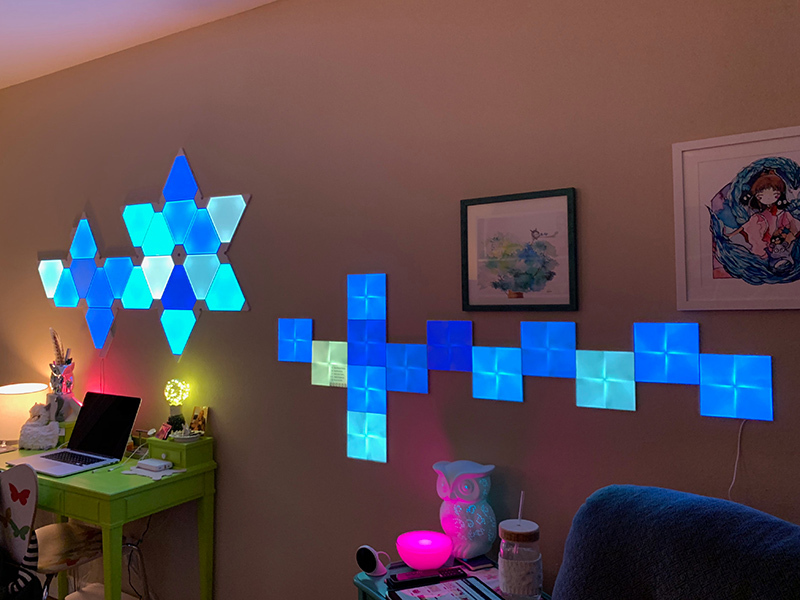 Nanoleaf's Canvas, launching today, is the company's second HomeKit-enabled mood lighting product that follows its popular triangle-shaped Light Panels. 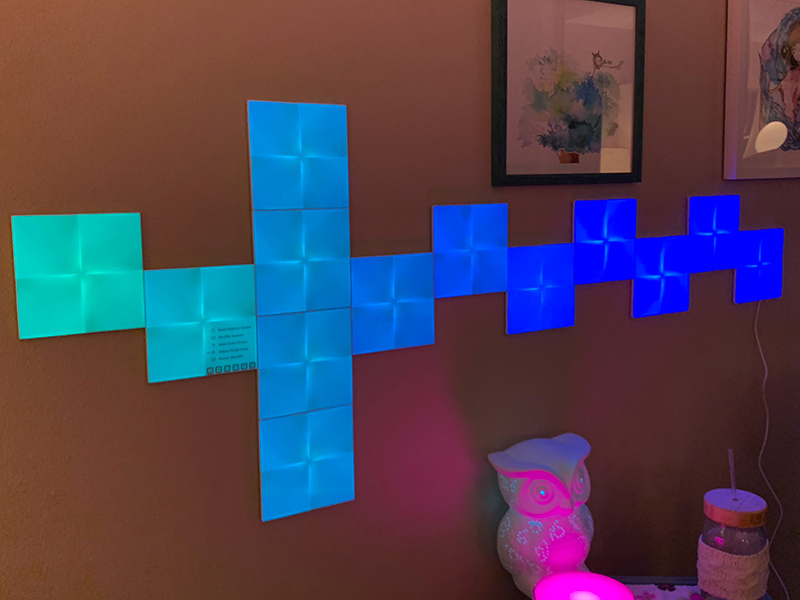 Rather than using triangle lights this time around, Nanoleaf designed the Canvas to have a square shape with multiple connector ports for more design versatility. What's more, the Canvas is touch enabled and puts thousands of lighting scenes at your fingertips without the need to use an app. The app and HomeKit availability are still available though, offering up multiple ways to control the lighting panels. 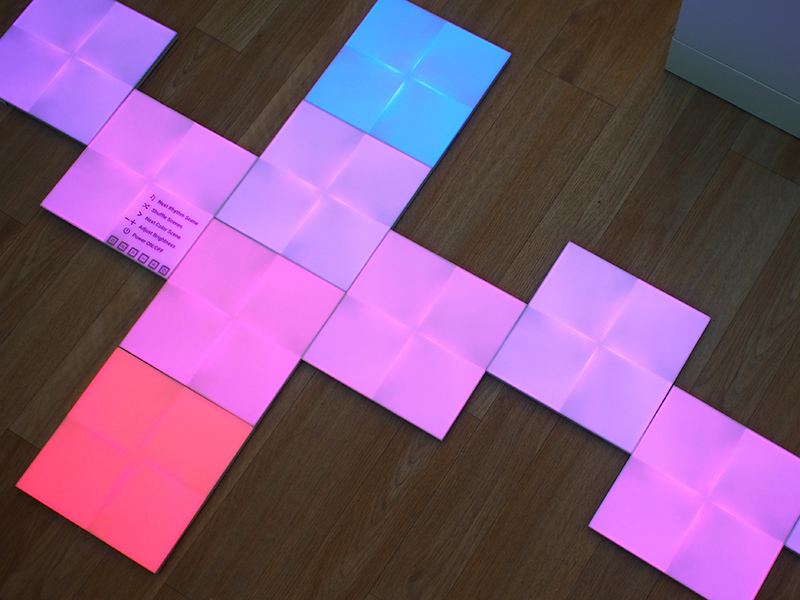 When conceptualizing the Canvas, Nanoleaf originally planned to offer plain squares with uniform lighting across, but this wasn't possible. Each square instead has a noticeable cross shape in it, dividing it into four. The individual squares still light up in one single color, but you will see the crosshairs within each one. I don't mind the crosshairs and in some ways they make the Canvas more visually interesting, but it could be a turn off for customers who were hoping for flat, uniform lighting across the entire square. 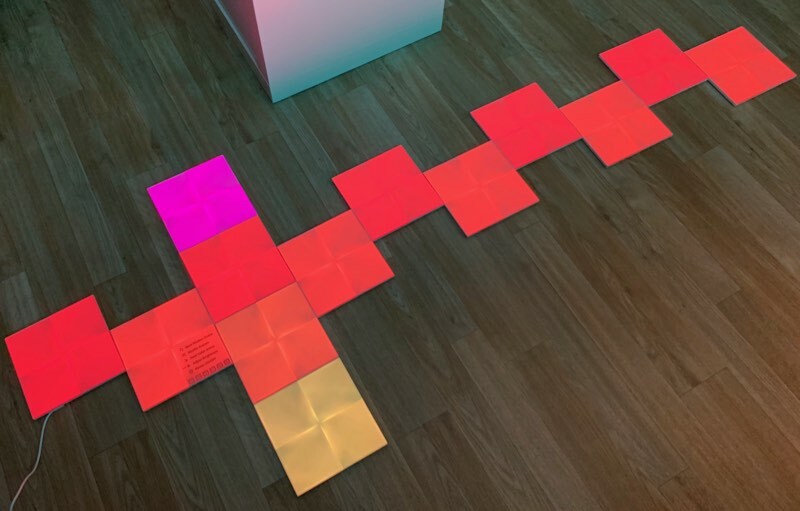 There are eight Canvas Light Squares and one Control Square, which needs to be centrally situated and accessible to touch because it's the square that features specific touch-based controls for the entire Canvas system, though all squares respond to touch. Canvas squares are attached to a wall with 3M adhesive like the previous-generation Light Panels. 3M adhesive is meant to be wall safe, but on certain walls, it definitely has the potential to cause damage, so that's something to be aware of. Because of the adhesive, it's best to decide on a design well ahead of time and a design that you can stick with for a long time because it is not convenient to re-arrange these squares. 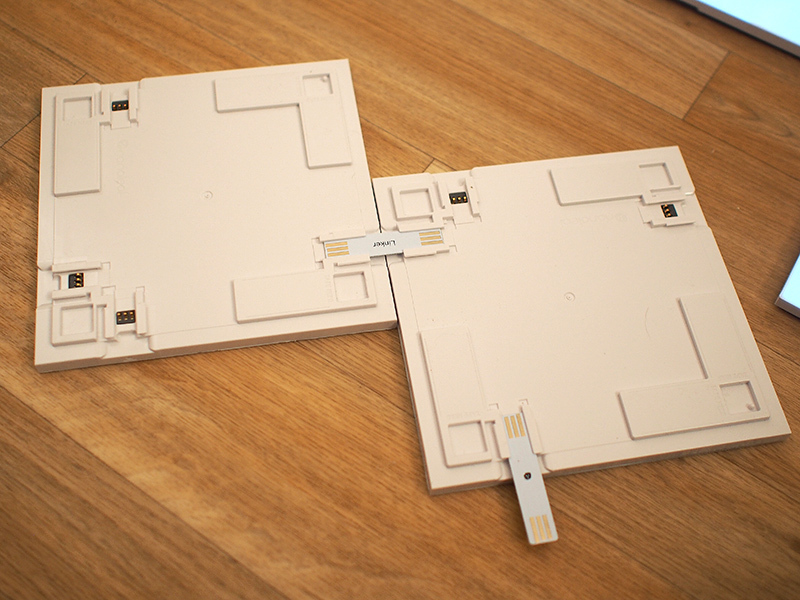 I'm sure current Nanoleaf customers are wondering if the Canvas squares connect to the Light Panels, and the answer is no. These are two entirely separate systems. When not turned on, the Canvas looks like a set of blank white squares on the wall, which isn't the most attractive setup, so that's something to be aware of. You're going to want to have the lights on most of the time to avoid having plain plastic squares on the wall. Canvas squares are designed for the wall, but you can put them on the ceiling or on a flat table. They also look amazing on the floor, but aren't going to hold up to being stepped on. 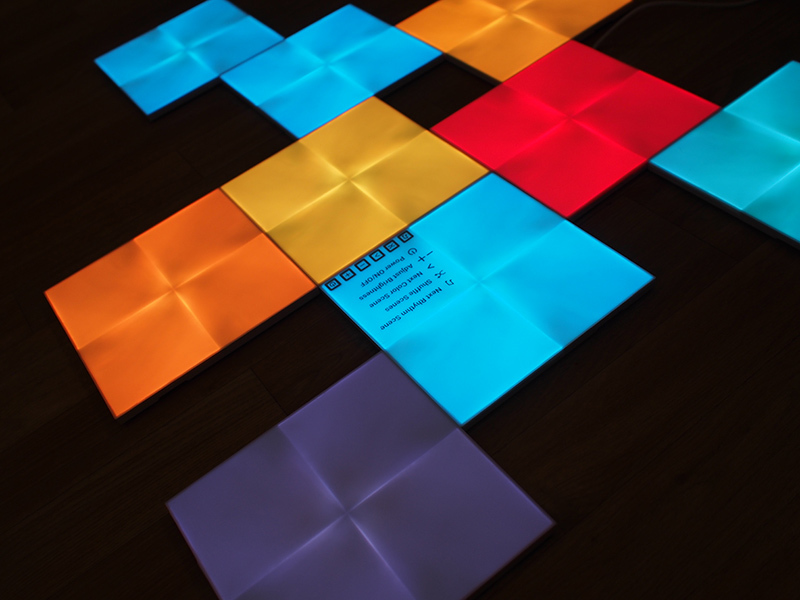 With the Light Panels, there is a separate Rhythm module that can be purchased as an add-on component, something that's not necessary with the Canvas as Rhythm functionality is built in. The Rhythm feature allows the Canvas to light up in time to the beat of music. 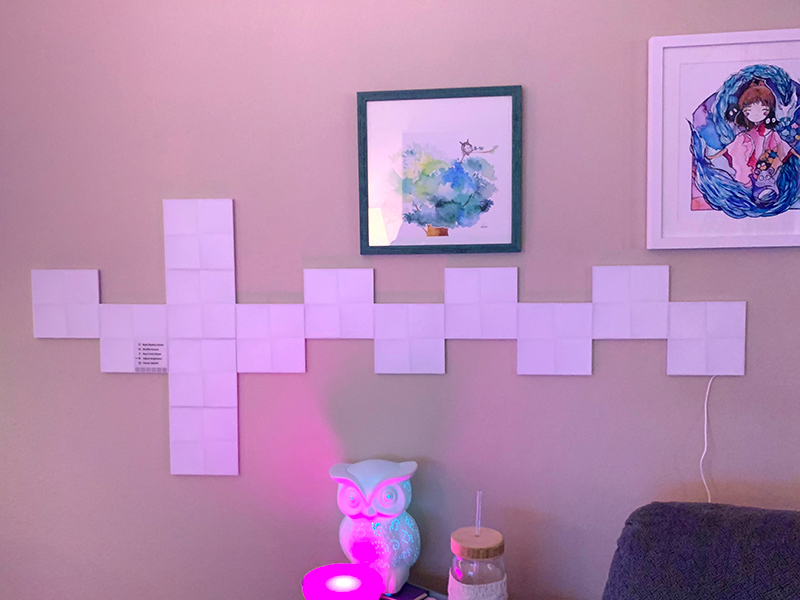 You set up the Canvas panels (do this on the table or the floor first to make sure everything's working before delving into adhesive) and then download the Nanoleaf app. 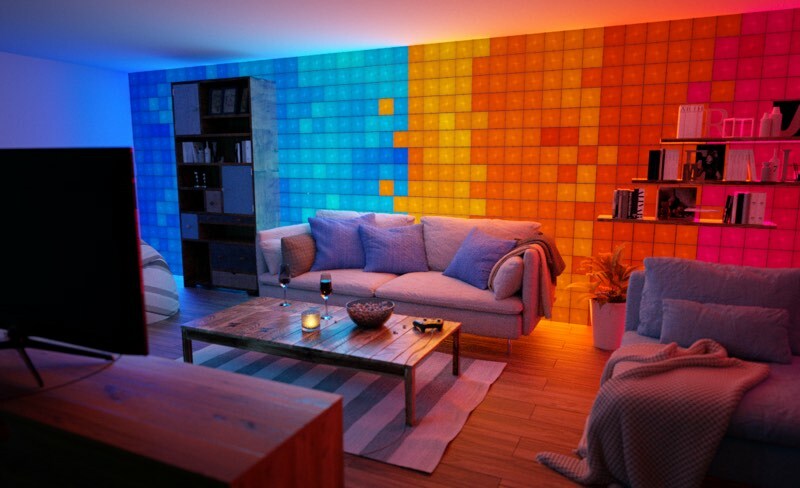 From there, you scan the HomeKit code, and it's added to your HomeKit and Nanoleaf setups. One thing to note -- Canvas, like the Light Panels, requires a 2.4GHz Wi-Fi connection so make sure to set your phone to the 2.4GHz network before attempting the setup process. 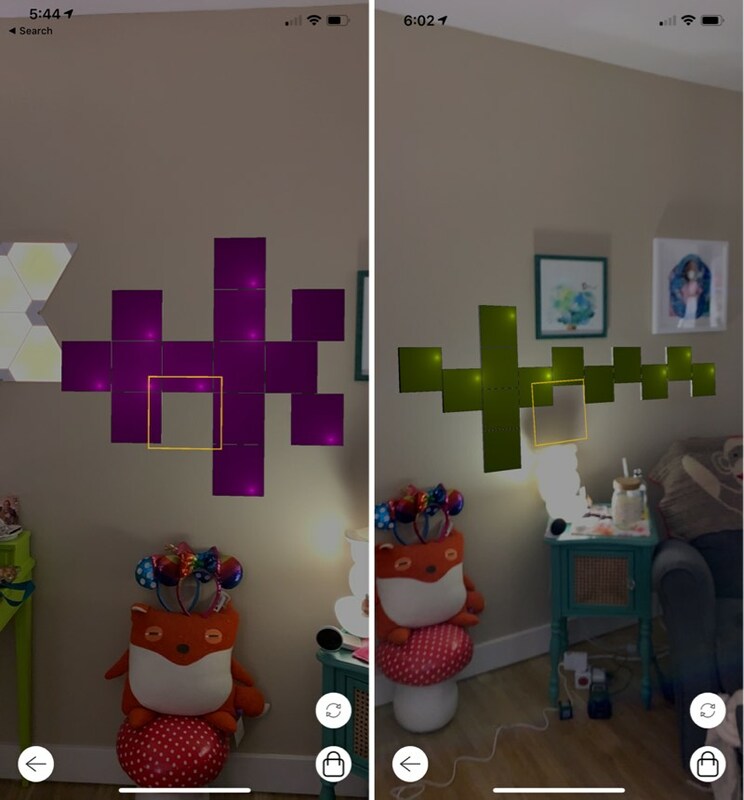 To figure out a design, you can use a floor or a table, but Nanoleaf has a super handy augmented reality function in the Nanoleaf app under the "More" section of the app. 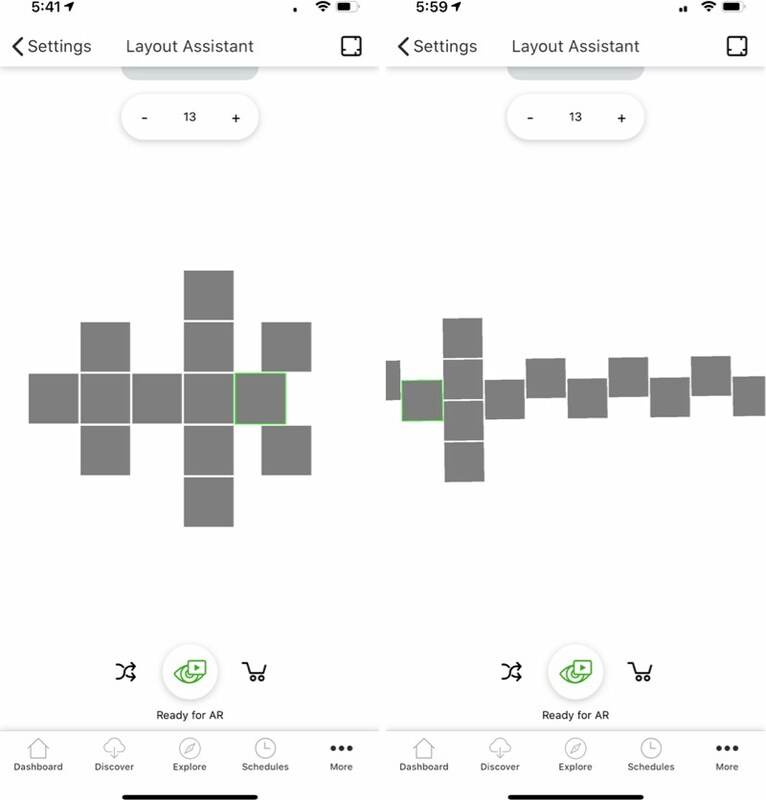 Called "Layout Assistant," the feature will let you arrange your Canvas panels in different ways to see what they'll look like, where the connectors will need to be, and there's an option to project it right onto the wall for setup purposes. You can select the number of panels that you have in the Layout Assistant and it will let you know what designs are available to you using those squares. There's also a great shuffle feature that I loved because it let me find designs that I might not have otherwise thought of. 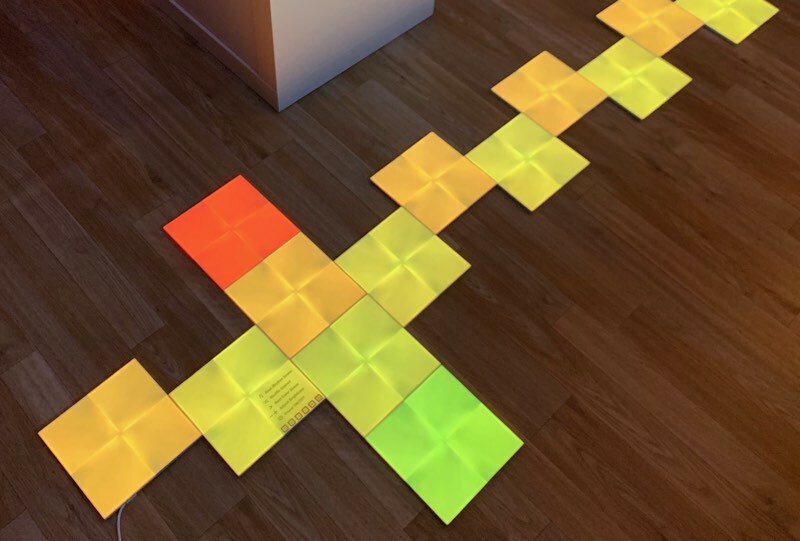 Nanoleaf has a useful app that works for both the Canvas and the previous-generation Light Panels if you have those. With the app, there's a dashboard designed to let you choose favorite lighting scenes with a tap, along with a slider adjustment for brightness. If you have two Nanoleaf products, you can switch between them within the app with a swipe, bringing up independent controls for each. You can't control them together within the app. There are tools for creating your own customized lighting scenes using millions of selectable colors and myriad pattern options and settings that change the way the colors are displayed on the Canvas. You can set the Canvas to all one color, two colors, or a dozen colors depending on preference, and you can use a pattern to shift between colors or choose static colors that won't change. Plain patterns not influenced by sound are available, along with Rhythm patterns that will cause the colors to fluctuate with loud sounds or music. With the Canvas, there are also some touch-based patterns available that are unique to the new model and aren't available on the older Light Panels. 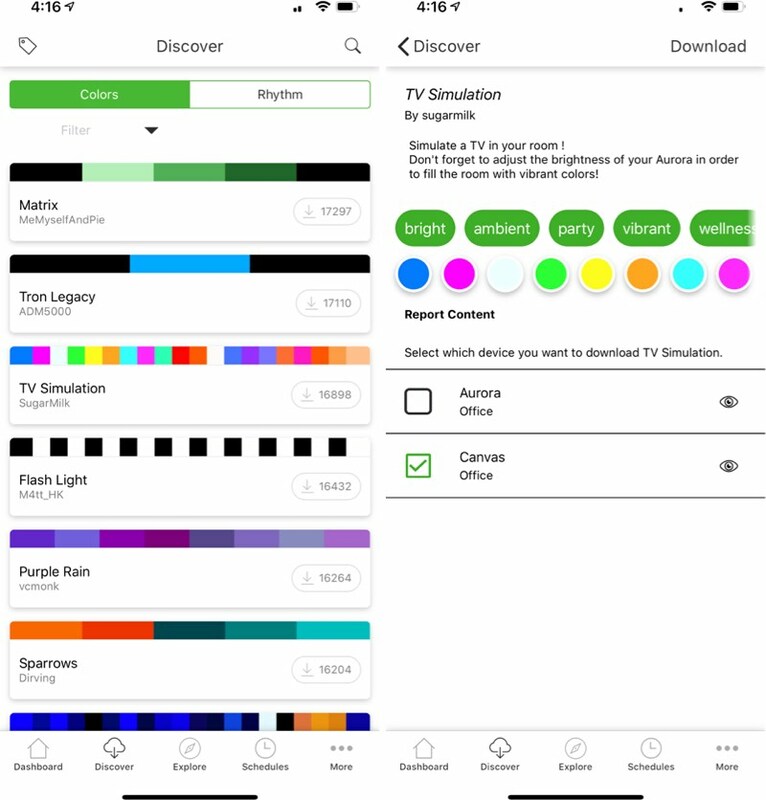 Along with these customizable tools to allow you to set your Canvas to any conceivable color and pattern, there's also a "Discover" feature with thousands of different lighting patterns created by other Nanoleaf users. This is the feature that I love the most with both my Canvas and my Light Panels because it lets me get fresh, unique lighting scenes and colors with no effort other than tapping a download button. 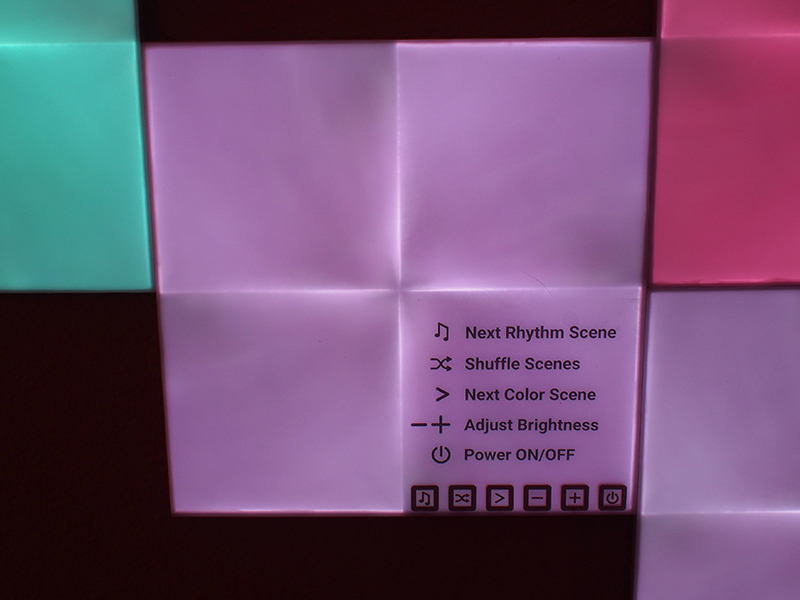 A "Schedules" setting allows you to choose specific times for various Nanoleaf scenes to run, with the option to set both a time and a scene. With schedules, you can automate a whole different color scheme for morning, night, bedtime, and more. There's also an extensive settings section of the app for managing devices, setting up HomeKit rooms, programming the accompanying Nanoleaf Remote if you have one, shopping for additional products, updating firmware, and choosing lighting layouts. I don't have a version of the app that's entirely optimized for the Canvas yet, but I will say that I think the layout can be a bit confusing and it may take some experimentation and adjustment to master it. Once you've been using the Nanoleaf app for a week or two and have all of your favorite scenes established, it's relatively simple. The Canvas is pre-loaded with hundreds of scenes that can be selected on the device itself, so it's more untethered from the app than the previous model. There's a single control square included with each Canvas set, and this square is the brain of the Canvas with built-in touch controls. There are options for selecting a new rhythm scene, shuffling through the pre-loaded scenes on the Canvas, selecting the next saved scene, dimming the Canvas, brightening the Canvas, and powering it off and on. The control square comes with a sticker that lets you know where to press to activate each feature, but once you've memorized the locations of the buttons, you can remove it. 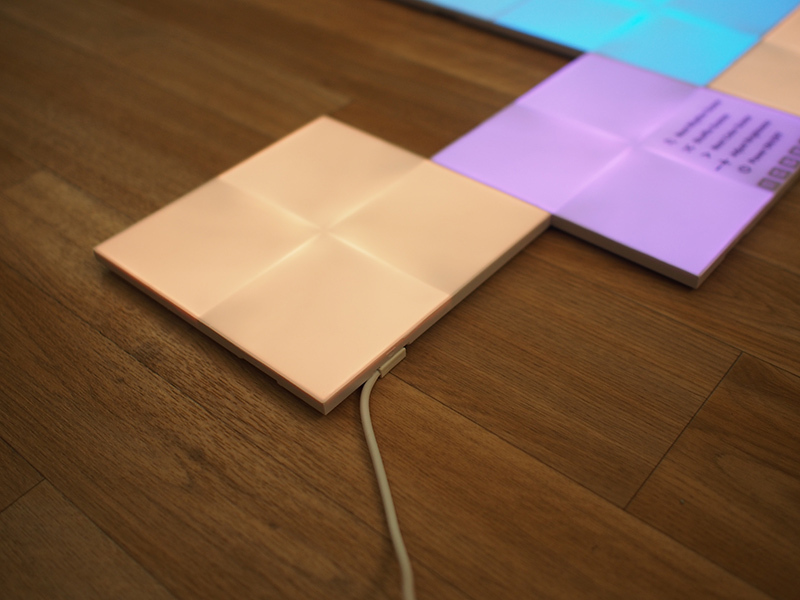 All of the Canvas squares are touch enabled so you're probably going to want to mount them in a place that's accessible to touch, but that is especially true of the control square. Basic scenes are plain white and static, available for when you want to use the Canvas for task lighting. 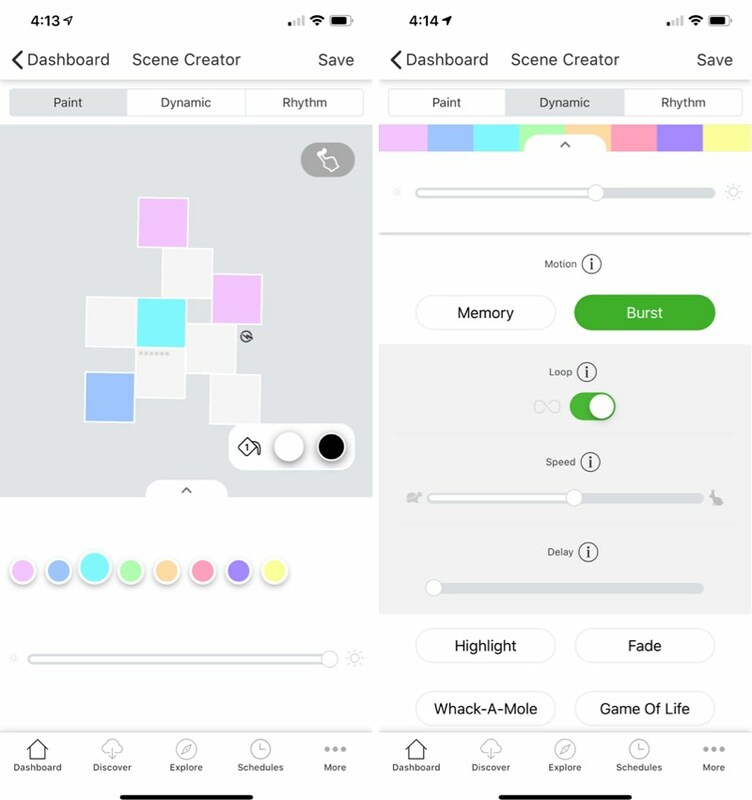 Color scenes are the main Canvas feature, allowing the squares to be assigned a color palette and a motion pattern that's used to swap between colors. The Canvas, like Nanoleaf's Light Panels, are compatible with HomeKit. Through Siri voice commands or the Home app, you can dim the Canvas, turn it on or off, activate specific scenes, or turn it to one uniform color. Siri commands like "Turn the Canvas on," "Dim the Canvas to 20 percent," "Turn the Canvas white," or "Set the Northern Lights scene" all work. You can also combine the Canvas with other HomeKit products through scenes and set up automations using the Home app. 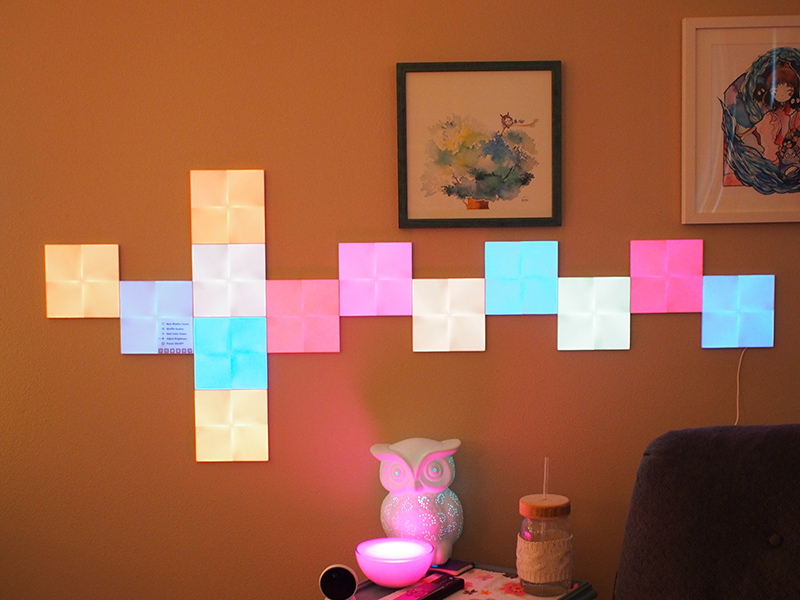 For creating Canvas scenes with specific lighting recipes or choosing individual colors for the squares, you're going to need the Nanoleaf app. Canvas is not a HomeKit product where the app can be replaced entirely with Apple's Home app, but between HomeKit and the built-in touch controlled scenes, you may not need to access the Nanoleaf app much. I've had a solid experience with the previous Light Panels, and reliability is important when it's a product that's permanently placed on the wall. 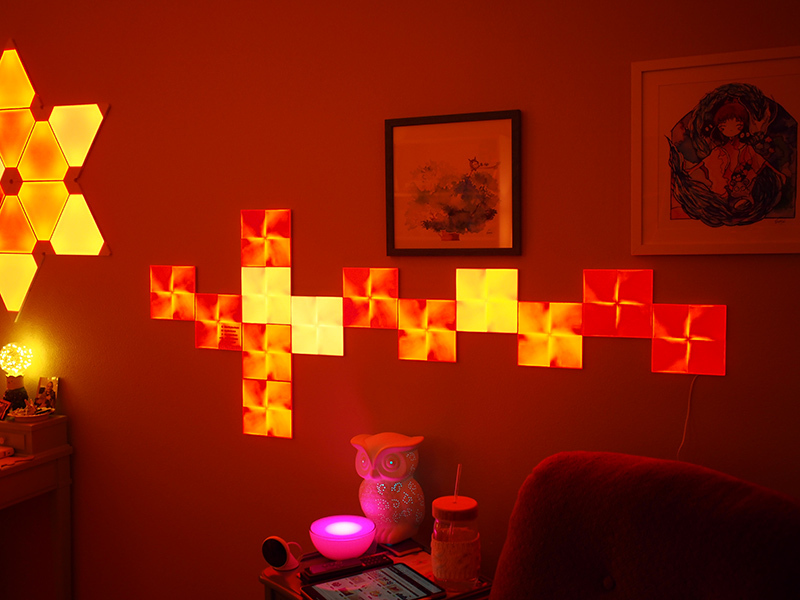 Nanoleaf's Canvas is pricey for a lighting product, but it is undeniably one of the best mood lighting setups available. As a wall-based solution, the Canvas doesn't take up any unnecessary room, it adds ambient lighting (or even main lighting with enough panels), and it serves as a replacement for artwork on the wall. Canvas and the triangle-shaped Light Panels are the first thing people notice when walking into my office, and I've never had someone not be impressed and awed with the aesthetic. 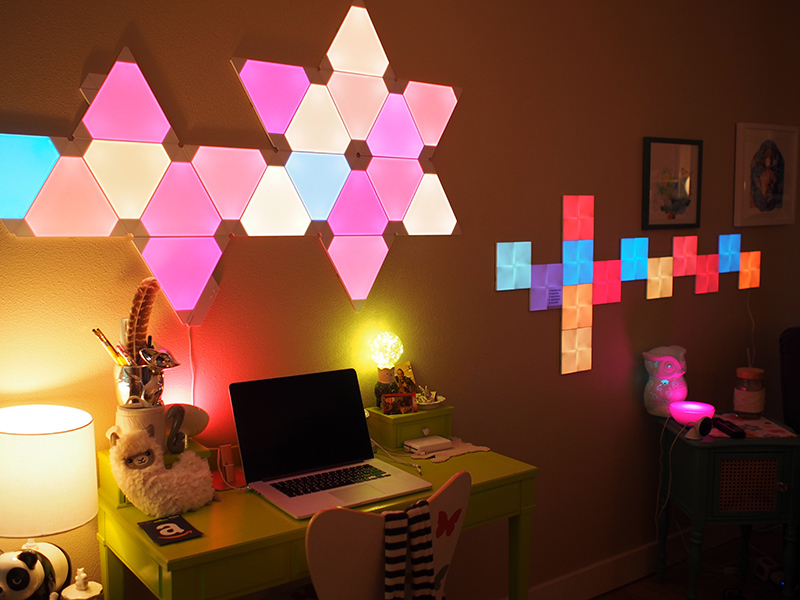 Nanoleaf's products are just plain cool, but of course, Canvas isn't going to fit in to every person's decor or budget. At $250, Canvas is $20 more expensive than the Light Panels, but it offers many upgraded features over the previous-generation option. Canvas is touch enabled, allowing for simpler controls, it has hundreds of built-in scenes, and with square tiles and additional connector points, there's more flexibility when creating a design. Depending on where you're putting the Canvas, the new touch feature might be superfluous. 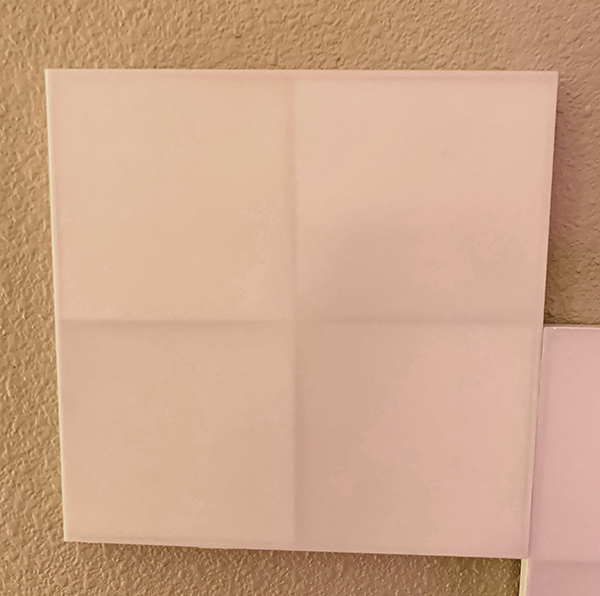 Placing the Canvas high up on the wall, on the ceiling, or behind furniture is going to limit the functionality of the squares, and that's something to keep in mind when purchasing. You'll need to have the Canvas within touch range or at least a square or two within range to take full advantage of all of the features that it has to offer, and that may be a dealbreaker for some setups. $250 is a lot to pay for lights that aren't entirely practical, but if you're looking for a lighting solution that adds ambiance and spices up a room a bit in place of some artwork, you won't go wrong with the Canvas. Nano leaf is cool stuff, but it screams I’m a 21 year old bachelor with tacky taste. 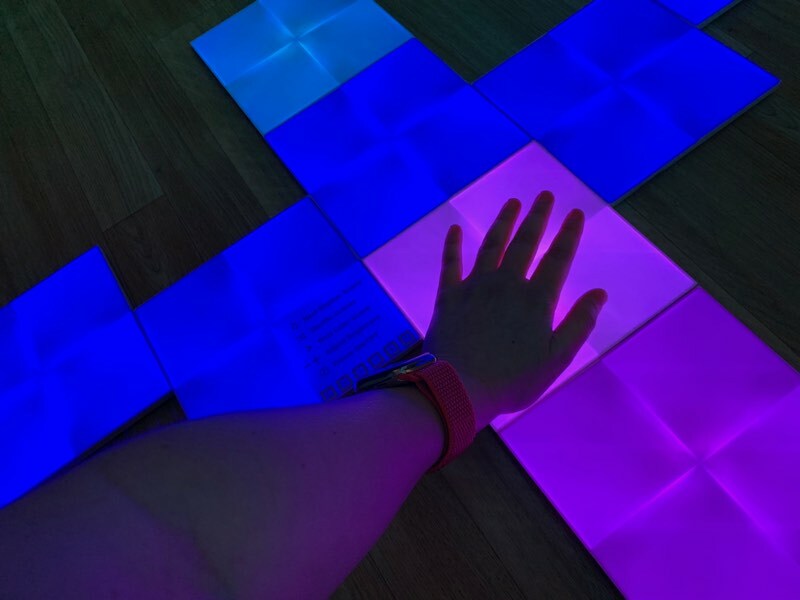 This is cool and likely could be great when combined with additional Philips Hue lights to create mood lighting. Alas, at $250 for 9 squares, I feel this is way too expensive. Anyone got actual suggestions for more affordable HomeKit mood lighting? Hue stuff is pretty great. You can get light strips (wait for a sale) and multiple kinds of bulbs. There's no other lighting solution that's similar to the Nanoleaf Canvas/Light Panels at an affordable price, though. 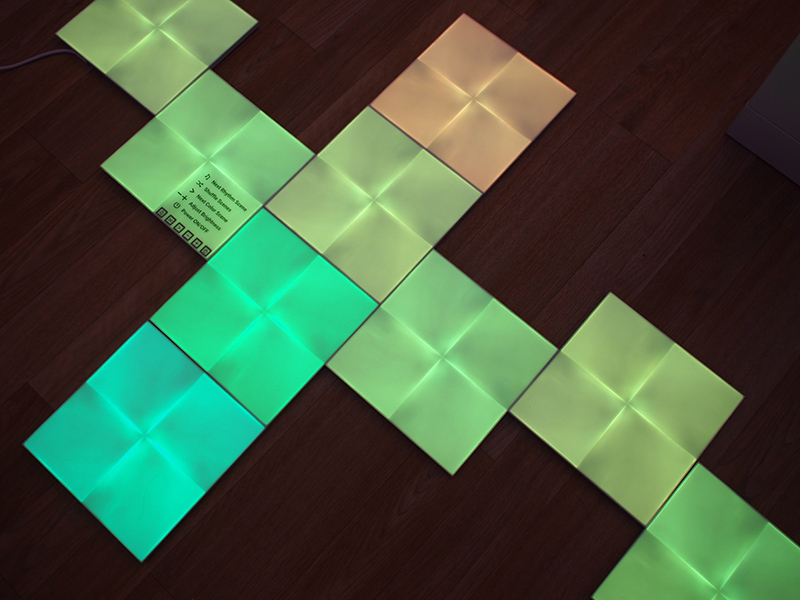 In fact the only alternative is LIFX's tile, also priced at $250 for 5 tiles. I haven't tried it, but the reviews haven't been great. So much fail here and not appealing at all.. maybe in a border around skirtings but those patterns are terrible. I wasted so much money on the triangles - constantly having to reset, delete from app, re-add the lights, scan code on the back of controller, re-download all the scenes only to have it do the same thing days, or a week later. I went through all of their troubleshooting steps with a rep, router settings etc etc etc. 3 times. Then they blamed my modem etc etc etc. You would expect better service for that price. They wouldn't even send me a new controller, I managed to get a new one in ANOTHER starter kit on sale, praying it would solve the problem and same thing. To hear they haven't solved connection issues is a huge red flag for this company. Meanwhile my 20 hue light system and controllers work flawlessly. Totally agree. They're also WAY overpriced for what they are. What is with everyone on these forums asking for the chinese to steal intellectual property? I get it, things can be expensive. But don't flat out steal from the original creator by buying a poor imitation that (in this case) will likely burn your house down.